Children with amblyopia, commonly known as “lazy eye,” may have impaired ocular motor function. This can result in difficulties in activities for which sequential eye movements are important, such as reading. A new study conducted at the Retina Foundation of the Southwest determined that children with amblyopia read more slowly than children with normal vision or with strabismus alone. Their findings are published in the Journal of the American Association for Pediatric Ophthalmology and Strabismus (AAPOS). Three groups of children were studied: 29 children with amblyopia with or without strabismus, 23 children being treated for strabismus but without amblyopia, and 21 children with normal vision. The children with amblyopia and/or strabismus had been referred to the Retina Foundation of the Southwest by 18 pediatric ophthalmologists in the Dallas–Fort Worth area. The children silently read a grade-level paragraph of text during binocular viewing while fitted with the ReadAlyzer, an eye movement recording system. The researchers measured reading rate, the number of forward and regressive eye movements (saccades) per 100 words, and the length of eye pauses (fixations). Comprehension was evaluated with a 10-item quiz. Only data from children with at least 80% correct responses were included so that it was unlikely that impaired reading in amblyopic children was due to comprehension difficulties. 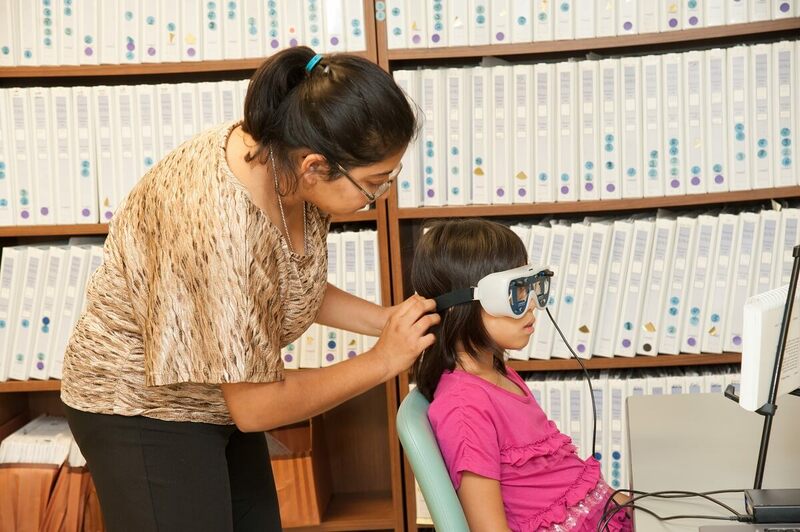 A child being fitted with the ReadAlyzer eye movement system. Photo courtesy of the Retina Foundation of the Southwest. Amblyopic children read significantly more slowly than strabismic children without amblyopia and normal control children. Statistically, there was not a significant difference in the reading rate between strabismic children without amblyopia and normal control children. Similarly, amblyopic children had about 35% more forward eye movements during reading than either strabismic children without amblyopia or normal children. Researchers contributing to this study are affiliated with the Retina Foundation of the Southwest, Dallas, Texas, and the Department of Ophthalmology, UT Southwestern Medical Center, Dallas, Texas. “Amblyopic children read more slowly than controls under natural, binocular reading conditions,” by Krista R. Kelly, PhD; Reed M. Jost, MS; Angie De La Cruz, BS; and Eileen E. Birch, PhD, DOI: http://dx.doi.org/10.1016/j.jaapos.2015.09.002. It appears in the Journal of AAPOS, Volume 19, Issue 6 (December 2015) published by Elsevier. Full text of the article is available to credentialed journalists upon request; contact Eileen Leahy at +1 732 238 3628 or hmsmedia@elsevier.com to obtain a copy. Journalists wishing to interview the authors should contact Krista Kelly at +1 214 363 3911 ext 108 or kkelly@rfsw.org.